Jupiter, our solar system's largest planet, is about to show its secrets. On July 4, a NASA spacecraft will enter Jupiter's orbit and start sending data back to Earth. It will be the first time scientists will be able to see what lies under the planet's thick atmosphere and clouds. People around the world will be able to follow the mission online. To do so, download software called Eyes on the Solar System from the NASA website. The mission is called Juno, after the spacecraft that will take the pictures. Its name tells the story of the mission. Juno was an ancient Roman goddess. In Roman mythology, Juno could see through clouds. Scientists say their Juno's mission will be to look under Jupiter's clouds to show its mysteries. Scientists hope to learn what is inside the planet, how it was formed, and other important information. NASA, America's space agency, launched the Juno spacecraft five years ago from Florida. And liftoff of the Atlas 5 with Juno on a trek to Jupiter, a planetary piece of the puzzle on the beginning of our solar system. Finally, on the evening of July 4, Juno will fire its main engine and go into orbit around Jupiter. For the next 20 months, the spacecraft will circle Jupiter around its poles 37 times and map the whole surface of the planet. 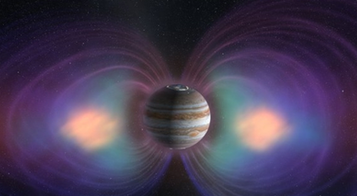 Juno will also study the planet's auroras. But Jupiter presents a hostile environment for the spacecraft. Juno project scientist Steve Levin explains. Jupiter is the biggest, baddest planet in the solar system, and it's got a bigger magnetic field, bigger aurora, bigger radiation belts, bigger gravity. Everything about it, really, is bigger. In fact, the radiation is so intense that scientists built a protective vault, or box, to keep the electronics of the spacecraft safe. ... which is basically a huge titanium box, and we've put all our most sensitive electronics inside the vault to help protect it against the damage that Jupiter would do (to) us. NASA says it hopes the data from Juno will tell scientists more about the planet's beginnings, structure, atmosphere and magnetosphere. This is a big job, partly because Jupiter is the largest and most massive planet in our solar system. It contains more than two times the amount of material of all the other bodies orbiting our sun combined, according to NASA. Most of the material left over after the sun was made went to Jupiter and formed what is called a gas giant. There is no solid surface, but scientists think there may be a solid center, about the size of Earth. Colorful cloud bands and spots make a pretty picture of the planet. Jupiter is especially known for the Great Red Spot, a spinning oval of clouds that is much wider than Earth. NASA says the speed creates jet streams that turn the clouds into bands. Because there is no solid surface to slow them down, Jupiter's spots and clouds can last a very long time. In addition, NASA says Jupiter has at least 62 moons. Together they form a kind of miniature solar system. Kevin Hussey is NASA's Visualization Technology Manager. He says that starting on Monday, you can tune in to see history in the making. On the night of July 4th, you're going to be able to witness this historic event, the Juno spacecraft being captured by Jupiter into orbit... And that event, scientists hope, may shine light on how our solar system was formed. I'm Anne Ball. All of my friends half-supported and half-laughed at what I was about to do. I saw through your little ruse from the start. We will leave the decision over till next week. If you want to see its future in the making, you really should visit. 1.Jupiter, our solar system's largest planet, is about to show its secrets. Although some of these nebulas appear like planets on the sky (hence their name), they actually surround stars far outside our Solar System. 2.Colorful cloud bands and spots make a pretty picture of the planet. Haze to cloud band, successfully to carry on. Cloud band is mainly gold. tunen. 曲调，调子，和谐，协调，调整 vt. 调整，为 .